Highschool of the Dead Chapter 30 is finally out! Despite a two year hiatus, the rotting corpses are as perky as ever in this zombie comic filled with fanservice. The motley crew of high school students continues to make their way to the evacuation point. A policeman, who is presumably Rei’s father, mistakes the group’s gunfire for Japan’s Self Defense Force. He’s corrected by a girl with glasses so you know she’s smart. 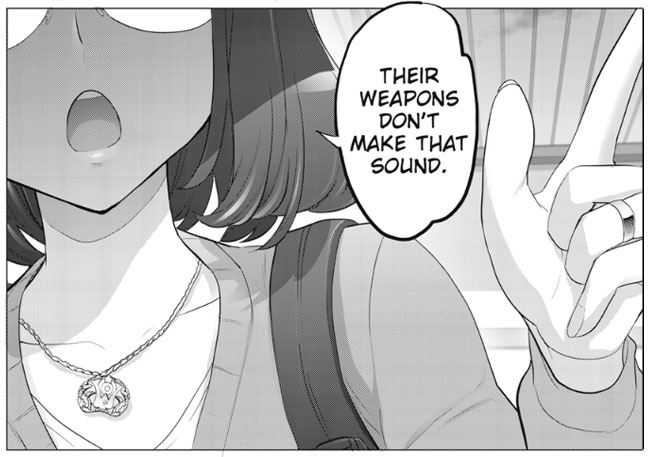 “Their weapons don’t make that sound,” she literally points out with her index finger extended. She’s clearly a female version of Kohta Hirano, the group’s resident otaku (nerd) who has become quite the eligible bachelor thanks to his knowledge of weapons and eagerness to use them. It doesn’t take a genius to realize these two will make a connection, if they don’t already have one. Yen Press is simultaneously releasing the manga digitally on kindle and iTunes.